First Line: It was shortly after dawn on a day in late spring that carried all the promise of summer to come. There won't be many walks in the French countryside for the village of St. Denis's Chief of Police, Bruno Courrèges. Not in the near future anyway. The area has been hit with a series of expert burglaries. The effects of a recently deceased veteran of the Resistance contain documents that may link him to an infamous train robbery. An antiques dealer is brutally murdered, and an academic ready to publish a book about France's nuclear weapons program has her home ransacked. With outside agencies more than willing to "lend a hand," Bruno needs all his skill and all his knowledge of the area and its people to solve these crimes. Whenever I learn that Martin Walker has written a new Bruno novel, I can't wait to get my hands on it. Each one is rich in character, rich in culture and customs, and permeated with the most delightful sense of place. The mysteries are intriguing and often tie into the history of the Perigord region of southwestern France. Although the inhabitants of St. Denis aren't angels, the village can seem too idyllic at times, but I don't mind a bit. As a former journalist, Walker has an eye for the telling detail, and once you've read a Bruno novel, you have a good grasp of the land, its people, its customs, and-- mouthwateringly so-- its food and wine. St. Denis is a French village as it should be, and I enjoy reading about it. It's easy to become hooked on Bruno's life in general: how he knows everyone who lives there, how firmly entrenched he is in the life of the village through his job and his participation in sports, celebrations, and good fellowship. Bruno is the perfect candidate for marriage, but Miss Right continually eludes him. In fact, he has some upsetting news on that front in The Resistance Man, and it's interesting to see how he comes to terms with it. If you're a crime fiction fan who yearns for plenty of forensics, you'll have to find that elsewhere; these books are all about how Bruno can solve crime through observing and knowing people. Yes, he has a gun, but he seldom ever carries it, let alone uses it. Each one of the subplots-- from the train robbery to the burgled houses to the murdered antiques dealer to the nuclear weapons program-- is interesting in its own right, but I loved seeing how Walker has Bruno tie them together. Martin Walker's Bruno Chief of Police series is an armchair traveling sleuth's delight. 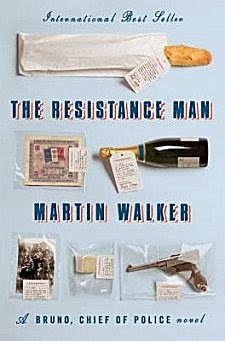 The Resistance Man can easily be read as a standalone, but why deny yourself? Curl up with Bruno and a nice glass of wine and prepare to be transported to a wonderful village in France. Cathy - Oh, I like this series too! And I really like the Bruno character. I think you've absolutely hit on it by saying that he solves crimes by knowing people, by putting events together and so on. That's the way I like my sleuths to work. And yes, St. Denis may seem a bit too idyllic, but hey, it's fiction!